The slope on Thursday – think orange! I’ve been in Suffolk for the last four days and as expected when I walked around as soon as I got back early yesterday evening everything had changed! Irises were flowering and those not flowering were full of bud. Dianthus were filling the air with their cinnamon perfume and the Clair Matin roses on the pillars of the terrace were in full flower. For Garden Bloggers Foliage Day I usually encourage you to share some particularly beautiful foliage in your garden at present or describe how you use foliage to enhance your garden. As my regular readers will know I depend heavily on foliage to give form, structure and texture to my garden. Foliage is the most important feature during the middle of summer when few plants are flowering. 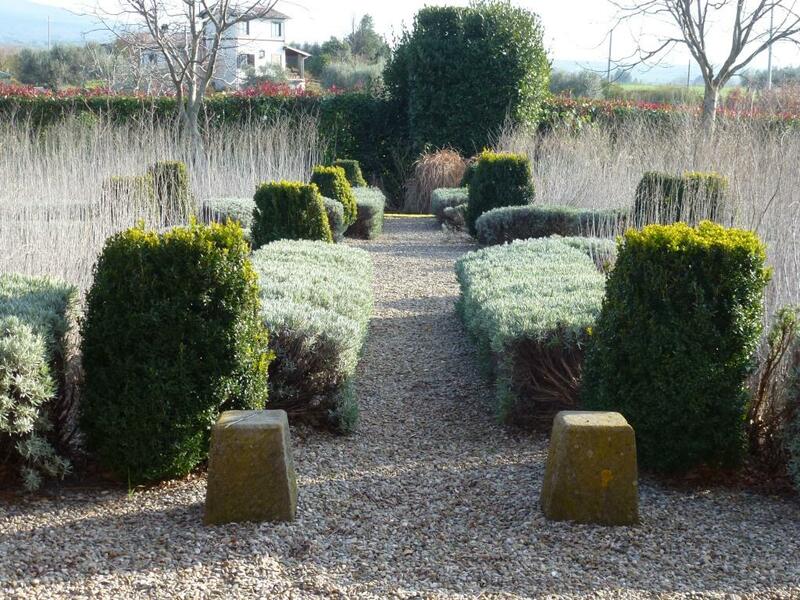 The formal garden is basically composed of three plants, Lavender hedging, Perovskia in the centre and Box cut-off pyramids at the corners. Monday is here again and with it comes the challenge of bringing flowers from the garden into the house for a vase to enjoy and share with everyone thanks to Cathy at Rambling in the Garden’s weekly meme.